On November 1st, the Frank Juarez Gallery hosted a reception for Milwaukee-based photographer, Adam Horwitz. 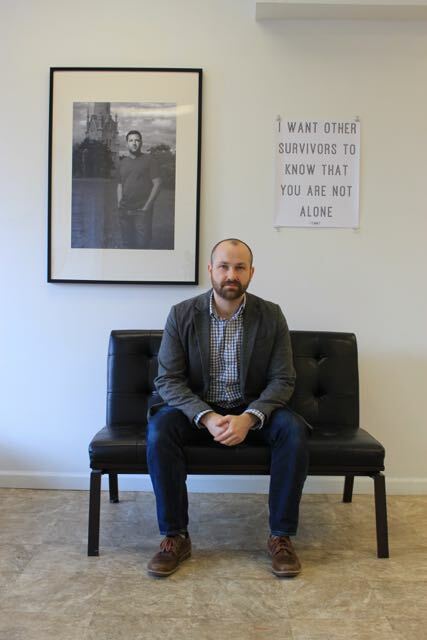 Adam gave a talk on his exhibition, “Portraits to Scale: Male Survivors of Trauma”. “Portraits to Scale: Male Survivors of Trauma” exhibition focuses on a small group of extraordinary people who have survived profound events in their lives, and have embarked on a journey of healing and growing through their camaraderie with one-another and the unique resources available through Milwaukee’s Healing Center. There is a paucity of actual data on abuse and trauma survivors, but one thing that seems to be clear is that abuse of males and females is very underreported, misconceptions abound, and resources are scarce. The Healing Center is one of the very few places that offer support and a safe space for both women and men who wish to embark on their healing journey. These men are not depicted as victims, a label that is often too easy to assign, and one that fails to portray who they really are, but as whole people. Complex and strong individuals, who have embraced their own healing journey and challenged the stigma associated with others who have survived trauma. Gallery hours are Saturdays from 10am – 4pm or by appt. 920.559.7181. Frank Juarez Gallery is located at 1109 North 8th Street in Sheboygan. *50% of all of the artist’s proceeds of this exhibition will be donated to the Healing Center, to support and further their mission to offer healing opportunities to survivors and their loved-ones through support, advocacy, and community education. This entry was posted in Uncategorized on November 4, 2014 by Frank Juarez.